LdM and partners organize musical laboratories for children in the Palazzo Vecchio and Palazzo Pitti, 25 Nov – 1 Dec. The LdM Institute, in collaboration with Marist, is proud to present "La Musica nei Musei", a series of musical laboratories for children and teenagers between 7 and 17 years of age. Playing a composition by Lorenzo the Magnificent in the Sala dei Gigli of the Palazzo Vecchio, or a piece by Johann Sebastian Bach in the Sala Bianca of the Galleria Palatina. For many of us this might sound more like a dream than reality, but for a group of Florentine children this soon will become a true experience! After an introductory visit to the spaces of the museums, maestro Martin Schaefer will guide the children during various sessions on their journey between past and present, using the art and impressions of their surroundings as a basis for the improvisational laboratories. 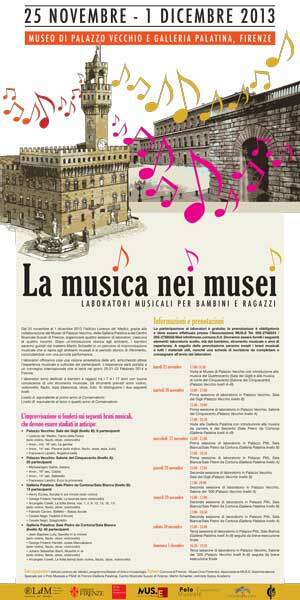 The results of the musical laboratories, together with a short video created by our MA Museum Studies students, will be presented during the conference La Musica nei Musei, which takes place from 20 to 22 February 2014 at LdM in Florence.